A lightweight, durable and compact mat truck that features high quality, furniture grade PVC pipes and rounded safety fittings which will not rust, corrode, chip or peel. Unique folding handle which permits upright storage requiring only 7"L x 22"W of floor space. Mat Mover is easily maneuvered or carried by one person, holds up to 400 lbs., and base design allows movement of many bulky items such as boxes, tables and barrels. Six heavy duty, ball bearing, swivel type casters with rubber non-marring wheels provide easy mobility in any direction. 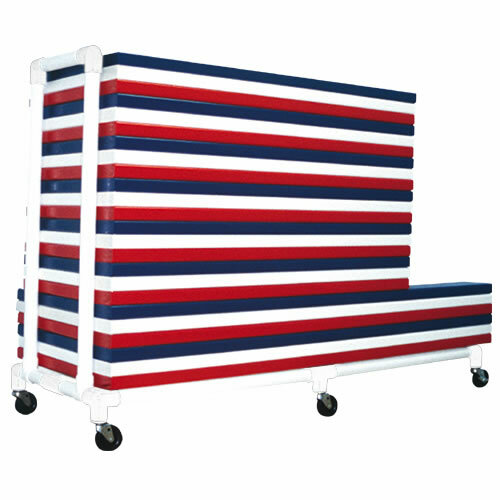 Mat Mover measures 66"L x 22"W x 7H with a 38"L x 16W folding handle. Easily fits through standard doorways. Can be stored in a closet. Easily assembled.